They say you can tell a lot about a person from their stationery. Personalised stationery is the mark of true taste. Using personalised business stationery sets you apart from the competition and speaks to the quality and attention to detail that your business offers. Builds your brand – Every time a client opens correspondence from you, they are reminded of who you are and your impeccable attention to detail. Serves as a constant marketing tool – Your personalised stationery is a physical reminder of your company values, high-quality standards, and personal touch. Increases networking opportunities – The contact information integrated into your personalised business stationery creates an opportunity for networking exposure each time someone comes into contact with your correspondence. Truly exceptional companies need exceptional business stationery. We make it as easy as possible to order personalised business stationery online. Design your own custom letterhead by uploading your artwork, or work with one of our templates to create personalized business stationery in a snap. 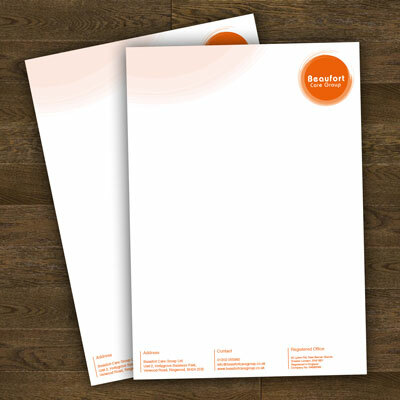 Our personalised business letterheads are printed on 120gm superior smooth cartridge. This has been specifically designed to perform through laser and inkjet printers. Our four colour printing is carried out on our modern Litho Printing Presses. The exceptional quality of the these machines allows us to produce printed work of the very highest standard, ensuring that whatever your message is, it is powerfully delivered. All of our products include full colour litho printing, you just need to choose if you would prefer single or double sided Letterheads. Delivery: Orders dispatched using next day courier delivered before 6pm. Print Speed: Orders before 2pm are dispatched the same day. Delivery: Orders dispatched using next day courier delivered before 12 noon. Delivery: Orders dispatched using next day courier delivered before 10 am. Orders placed on weekends or bank holidays will be processed the next normal working day and delivered the following. We are not able to offer a Saturday or Sunday delivery. UK public bank holidays may affect your delivery date. Larger quantities will not have upgradable delivery options so will not show in the pricing matrix.